Last week, I was reading an article in the Chronicle of Higher Education, that listed Private Donations to private and public institutions of higher learning. What amazed me, that Harvard University received $1.1 billion last year. That's about Rs. 7,000 crores. I was reflecting, that in our desire to become world class, we have to compete against institutions that have a great history, an enabling policy environment, and an incredible tradition of community and alumni support, that motivates and enables them to keep getting better, and widening the lead between them and the others. We give to places of religious worship, and we should, but we should also give to places of learning, and places that make the world a better place. That makes society so much richer!! A few days ago, I was at Somaiya Ayurvihar, with my daughter, who was there for a checkup. Assisting Dr. Radha Verma were many of her resident doctors. Among them was Zafar. He grew up in Antop Hill in Mumbai, and grew up in difficult financial circumstances. He was working since the age of 14, and used to carry TVs and other items people would need. Now, he did his medicine at Sion and was now doing further work in surgery at our Medical College. What a wonderful story of hard work and success. I feel privileged that we have students like that with us, who I am sure will contribute to the making of our country. 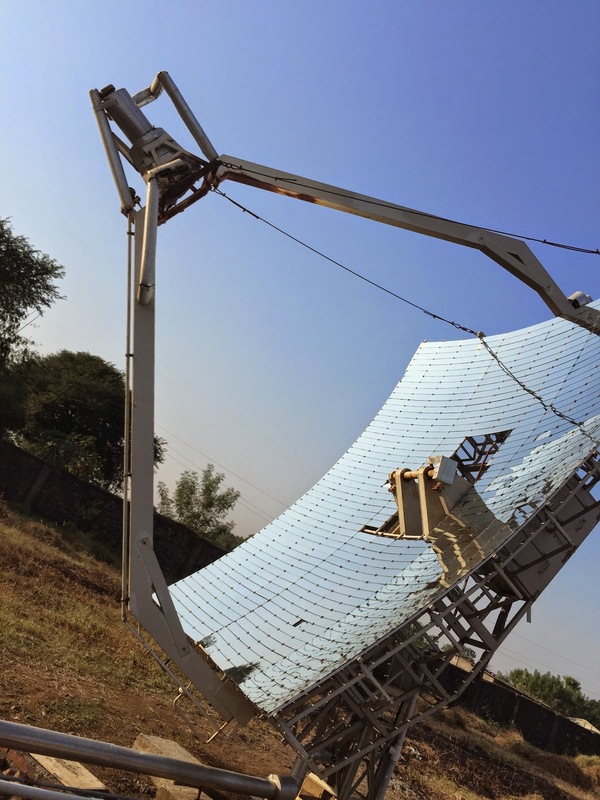 A few weeks ago, I visited our school in Nareshwadi (Dahanu), and saw the installation of the solar concentrator. 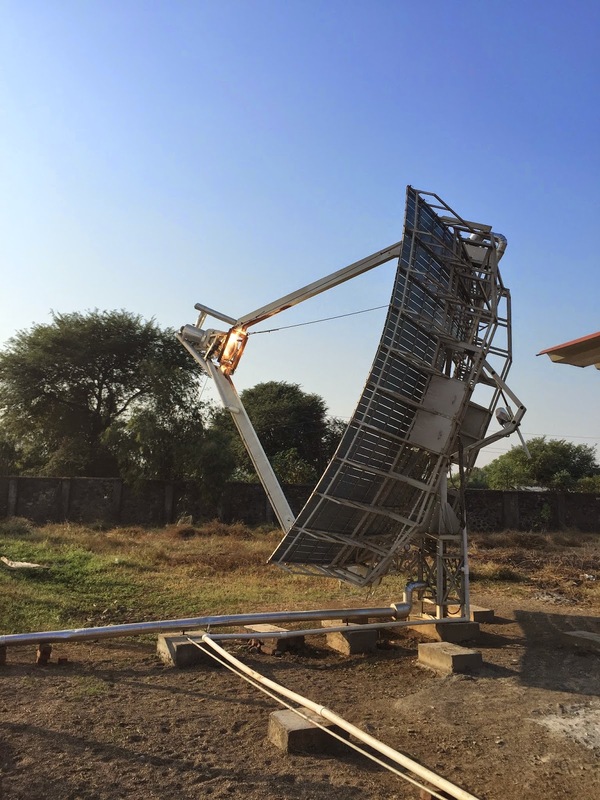 It was wonderful to see, sice after the installation, we are now saving 200 kg of firewood a day, and all the food for the hostel kids, the dal, the rice, and the vegetables get cooked through steam, from the heat generated by the concentrator. A simple idea, suggested by Sandeep Shah of N A Shah Associated, and implemented by ATE (Anuj Bhagwati and Vishal Sardeshpande). There are 500 students living in the hostel, and this is wonderful, that we can create an energy system that reduces our costs, conserves the environment, and comes together in a spirit of making the world a better place for all of us. Thanks to all that made this happen. I was invited by Professor Ray Goldberg, an 88 year old powerhouse, who wants people from Industry, Government, NGOs, and Academia, to create a better food system. There was a wealth of discussion on making healthier food available to all in the world, in a safe and sustainable manner. Members of PAPSAC spend 2 days discussing and pondering over these issues. What struck me, is the amount of time and energy that US food system spends in making sure that the food is safe, and that there is no contamination. Whereas, we here in India, routinely avoid eating certain kinds of food, since we are not aware as to whether we will suffer from the eating of the same. Or that we hear about contamination of food so often. The Department of Nutrition at Harvard, publishes a super website, on what makes a nutritious meal. And they do research on diets all over the world. One study they did, was the comparison of the traditional Tamil vegetarian diet, and the negative effects of introducing 'fast' foods on the public health. There was another initiative, wherein, doctors are now prescribing fruit and vegetables for certain ailments, as opposed to medicines. The University and some NGOs, are actively requesting doctors and hospitals, to incorporate, what we call 'naturopathy', into their prescriptions. And very interesting websites, on the global burden of disease. Our institutions must also bring together teaching, research and active engagement to make our environment a better place. Last Sunday, we took a heritage walk in Mumbai, along with my Harvard classmates who had come to visit India. The walk was led by Sarthak, whose passion was heritage. What a wonderful walk it was. He took us through just a few hundred m walk around Kala Ghoda, and there was so much to learn. On Gerald Aungier, who offered various business incentives, which attracted Parsis, Goans, Jews, Dawoodi Bohras, Gujarati Banias from Surat and Diu, and Brahmins from Salsette. They came to make Mumbai, the business capital that it still is. On inviting one and all. On the planning of the city. About the open giving of Cawasji Jahangir. So much so, that he was also called Mr. Ready Money. Always ready to give money to a worthy social cause. Or the giving of David Sassoon, who came from Iraq, against the religious persecution of the Iraqi Pasha, and earned his wealth here, and built the Sassoon Docks, and also the training institution, which is now called the David Sassoon library. Or the Rajabai tower, constructed by Roychand Premchand, so that his mother did not need to strain herself to see the time, when she had to take medicines. Or, the building of Flora Fountain, the Elphinstone College, the Institute of Science, and the city itself. Or the coming together of the people who built Art Deco buildings in Marine Drive, when the land was reclaimed. They decided on a common visual language, for harmony, for the city. Not trying to outdo one other for themselves, but for the city. Everyone should do the walk, and to learn about the big heart that we once had. Last year, I attended the meeting of the Cornell Council, of which I was a member. I attended the talk by the Head Librarian of the University, when she explained, that libraries were the gateway to knowledge, and opened a window of information, opportunity, and that the task of the librarian was to enable the search of the student and teacher, as they looked for knowledge. Yesterday, I was so happy to see, that our IT team, has made it possible for students to use our library page, to look for information. For books, ebooks, new, and journal articles. And students across the campus will be able to borrow books from any Somaiya Vidyavihar library. Now, for us to be able to create an environment to be able to take advantage of the same. Last week, I was at Churchgate, outside a restaurant, where I met a young 14 year old girl, who was selling some goods, as a hawker. I asked her, whether she went to school. She said she did, but she sold these toys to make a living. I asked her, what she wanted to be, when she grew up, and she said that she wanted to be a doctor. Yesterday, I was there again, and say a young girl selling flowers. I asked her, if she knew the young girl, who wanted to be a doctor, who also sold toys there, and she repeated to me, that she was that very girl. I got lost in the 'debate' that you are not the girl I met last week. That was someone else. After I left, I realised, that although she may not have been that girl, she was like her, in the sense that she also had dreams, and dreams of becoming a doctor, and all she was doing, was trying to persuade me, that she wanted a future too.